Games of Berkeley turns 37! Now here we are in a new building, in a new neighborhood, open to new ideas, and very definitely open to new customers. Join us as we celebrate 37 years of games, toys, activities, and experiences! We’re dressing up – how about you? Because 1980 was both the year GoB opened AND the year that The Empire Strikes Back was released, we’re encouraging our employees to cosplay in Star Wars gear or their favorite 80s fashions. How about our customers, too? Why not mix and match? We’re pretty certain Boba Fett would look fantastic in leg warmers. Show up in Star Wars or 80s apparel, and we'll give you a limited-print sticker featuring our Evil Empire Strikes Back logo! We always encourage people to Play Everywhere, and really enjoy seeing the places folks play the games and activities they get from us. So for 2017, the Play Anywhere contest will again be a part of our anniversary festivities. Send us a picture (Twitter, Facebook, or Instagram) of your gaming group playing together, and you could win one of our gift certificates! Use #GoB37 and #PlayAnywhere in your post. - Most loyal customer (hint; come play at the store!) - $50 gift certificate! - Most creative location (go wild, go anywhere!) - $75 gift certificate! - Largest gaming group (and every member of the group can submit a picture for their chance to win!) 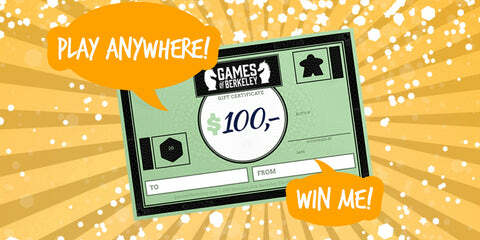 - $100 gift certificate! * No purchase necessary. Entries may be submitted up until 11:59pm on June 9th, 2017. Only one winner per category. Store employees and their family members are excluded. Help us to help those in need! We’ve decided to call attention to local charitable organizations this year. The first of these is the Berkeley Food Pantry, which serves the needy in Berkeley and Albany. Homelessness is an issue that both residents and visitors in Berkeley are well aware of. We're donating 5% of our Anniversary Week profits to YEAH! (Youth Engagement, Advocacy and Housing) to aid in their support of young adults currently living on the streets in Berkeley. We'll also be collecting game donations for YEAH! 's shelter facility (new or used are fine, so long as they're complete), or you can donate funds directly via THIS LINK. Y’know that door just past our jigsaw puzzles? Normally it leads to our office access and emergency exit, but during GoB’s Anniversary week, it’s going to serve as our Clearance Sale Section! * Discounts do not stack. Not good with any other offer. IT'S BEEN A GREAT 37 YEARS, AND WE'RE LOOKING FORWARD TO ANOTHER 37 MORE!